Welcome to week eight of our Whole New Dad program. At the end of this week you will be two months into your training and are coming off a tremendous accomplishment last week. A two-mile run with no walk breaks, awesome. One thing that we haven’t talked about to this point is what happens if you have to skip a workout. Life happens to all of us. Meetings run long, children are sick, trips come up unexpectedly. Heck, even we fall ill from time to time. The worst thing that you can do at this stage of your exercise plan is to feel like you have to make up a missed workout. Remember, slow and steady wins the race to improving your fitness. We’ll talk about “racing” in a couple of weeks. But right now staying consistent as we gradually increase the amount of time you are running and decreasing the amount of time you are walking is what is going to get you safely and most importantly confident and injury free to that 5K starting line. Much has been said and written about the end of the marathon. It is described as exhilarating, life-affirming and thrilling. It can be humbling, emotionally draining and crushing. Runners talk a lot about what it feels like after they finish the race. How it was worth all the blood, sweat and tears to fight to that finish line and earn that finisher’s medal. When they do, what they are really talking about however is those moments immediately after the marathon. Very few speak of the first time they try to step up onto a curb. The first time they bend over to untie their race shoes or heaven forbid, the first time they actually try to walk down a flight of stairs without turning around and going down backwards one step at a time. Those are the real moments of post-marathon “glory”. When a runner who would not allow anything to stand in their way for well over three hours of racing can now hardly shuffle down the hall to the bathroom. Oddly, after my most difficult race, in the most difficult of race conditions, on the toughest marathon course I have ever run, I am the least sore that I have ever been after racing 26.2 miles. Now keep in mind “least sore” does not mean the same thing as “not sore”. Oh, I’m sore. My calves are tight, my quads are still feeling the burn of all that hill racing and the outside of my hips are tender. But all things considered. I feel like a million dollars. On Monday I took the day off of work and did my best to start the recovery process. I took Landry to school in the morning, had a 60 minute massage, walked up and down the aisle of the grocery store, using my cart as a “walker”, took Kayla for her afternoon walk and then cooked a nice dinner for Dawn. I am taking the stairs forwards and feeling pretty darn good actually. On Tuesday morning I hopped on the tri-bike in the garage and spun on the trainer for 30 minutes. Just a short 9 miles, but it felt good to get the blood flowing back to my legs after stiffening up overnight. Another bike ride on Wednesday morning lasting 45 minutes and I’m just about ready for my first trial run post-race. It’s a good thing too as you might remember that it is race week again. 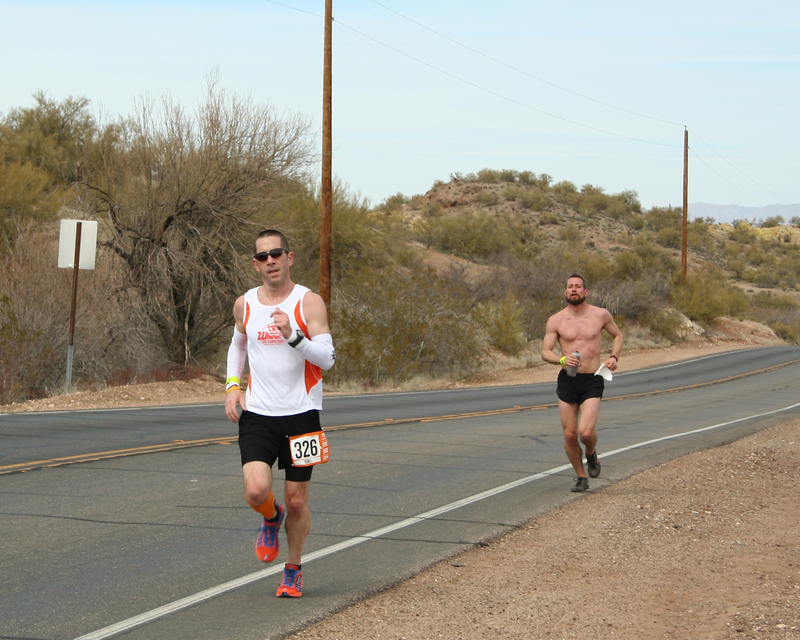 Yep, on Friday afternoon at 1:00 p.m. MST, I will be standing on the street in Wickenburg, AZ underneath a starting banner with a Bib Number pinned to my shorts and a timing baton wrapped around my wrist. 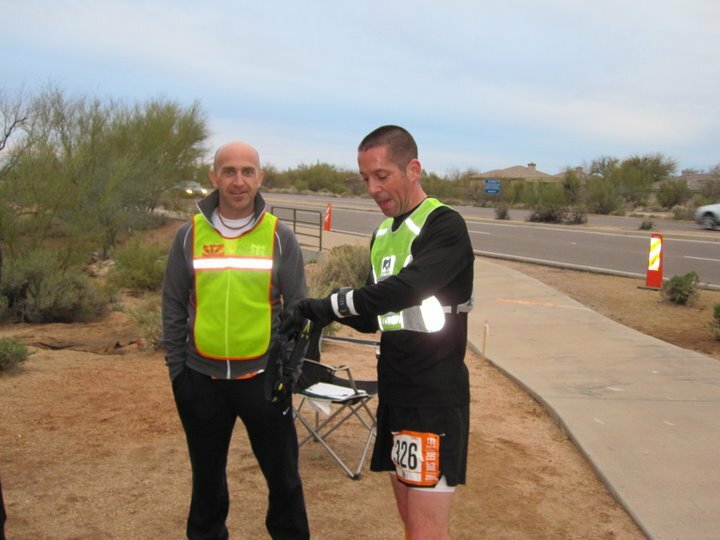 I will be running the first leg of our team’s 12 person 200 Mile Ultra-Marathon relay from Wickenburg to Tempe. 8.3 miles in the Arizona Sun, followed by a 7 mile leg roughly 9 hours later, after my 11 teammates run their respective first legs. Then I will have a short 3.5 miles to cover as my final leg sometime around 6:00 a.m. Saturday morning. 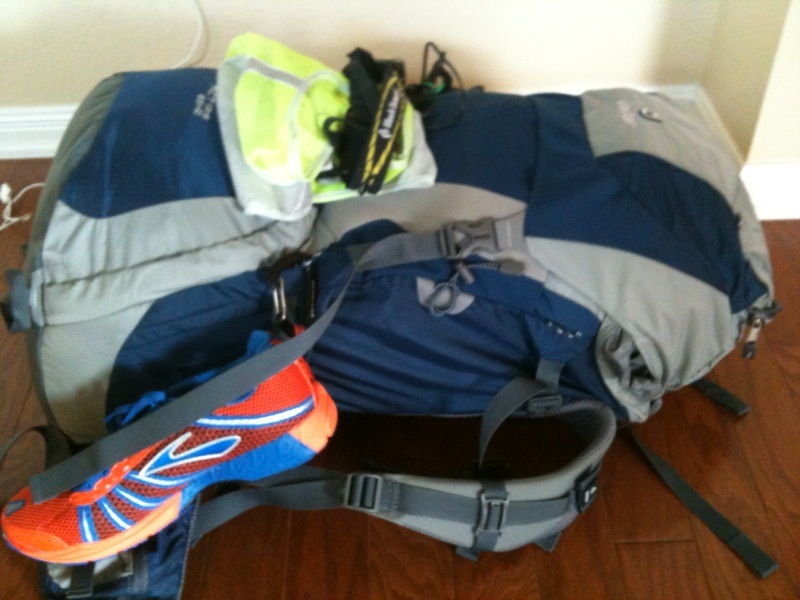 This will be my first time running a relay race, and my first ultra-marathon experience. 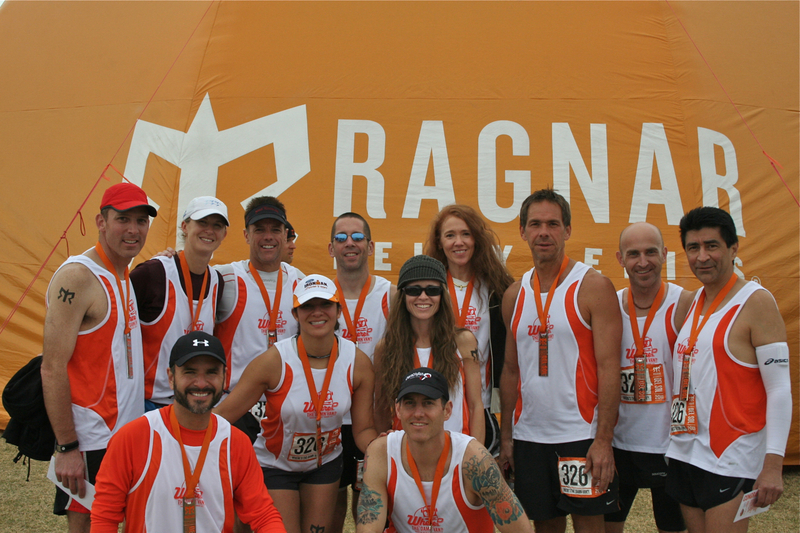 The total distance for Ragnar Del Sol is just a hair under 200 miles. If you’re going to jump in, you might as well do it with both feet I suppose. Truthfully it is more about “who” I am running with than “what” I am running. Our team Captain Jenny Jowdy from St. Louis, MO, Husband and wife Kim and Michael Miller from Scottsdale, Steve Spiers from Va Beach, Sean Brown from Cincinnatti, Nina Atlee from the Dallas/Ft. Worth Metroplex, Eddie Rodriguez from Houston, Thomas Neuberger from Baltimore, Dan Corredor, Carol Tichio and Andrew Meir from the Phoenix area and yours truly from Austin, TX. Our team is divided into two 6-person groups. 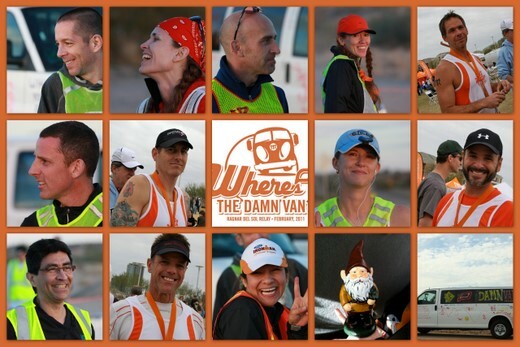 Each group will be spending the better part of a day straight in their respective 15-passenger van, hopping out, running their assigned leg through the Arizona desert, and then hopping back into the waiting van moving on to the next exchange area. We have to run our legs in the assigned order. So being the “first runner” I will run legs, 1, 13 and 25 of the assigned 36 legs. Covering 18.8 miles total in what looks like it will be 16 or 17 hours. Not quite another marathon, but I’m sure it is going to feel like it by the time that last leg is in the books Saturday morning. People ask me often if I ever get bored running. Valid question I suppose if you are not a runner as from the outside looking in I’m sure it must seem like a monotonous activity. But the truth is that there is another challenge waiting right around the corner. 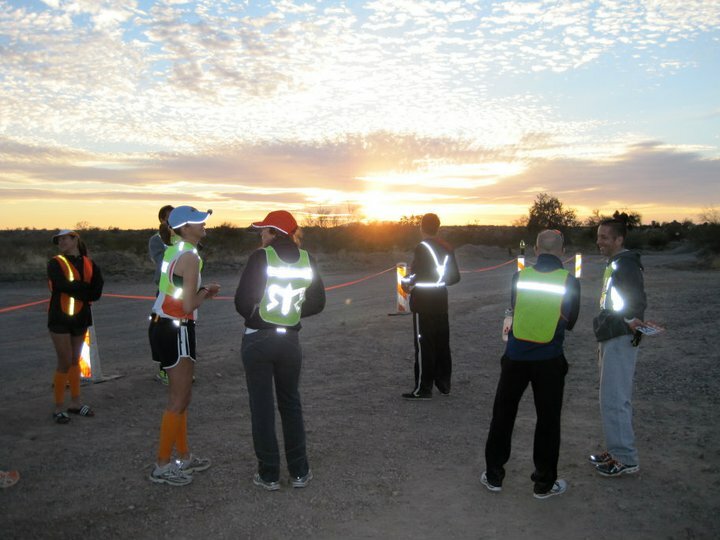 Whether it is racing, training, exploring a new city in the wee hours of the morning or in this case, strapping a headlamp to your head and running through the desert with 11 of your closest friends. So tomorrow morning I leave on a new adventure. I will be getting on the airplane here in Austin with my carry-on bag full of three pairs of running shoes, shorts, tights, singlets, long-sleeved running shirts, a headlamp, a lighted reflected vest, hats, gloves, body glide, socks, runderwear, power bars, some toiletries and not a damn clue what to expect. I don’t know how fast I’ll run, if my legs will loosen up from all this soreness or if it will even matter. All I know is like every mile I’ve run since my good friend passed away last August. I’m going to make every single one of them count. I ask you. Does any of that sound boring? I’d love to hear from you while we are out there, and oh yeah, they’ll be another race report coming after the weekend. You won’t want to miss this one. “It was the best of times, it was the worst of times; it was the age of wisdom, it was the age of foolishness; it was the epoch of belief, it was the epoch of incredulity; it was the season of Light, it was the season of Darkness; it was the spring of hope, it was the winter of despair; we had everything before us, we had nothing before us; we were all going directly to Heaven, we were all going the other way”. I have read that passage more than 100 times in my life, but never did I truly grasp its meaning until Sunday morning. Not to sensationalize a simple footrace. 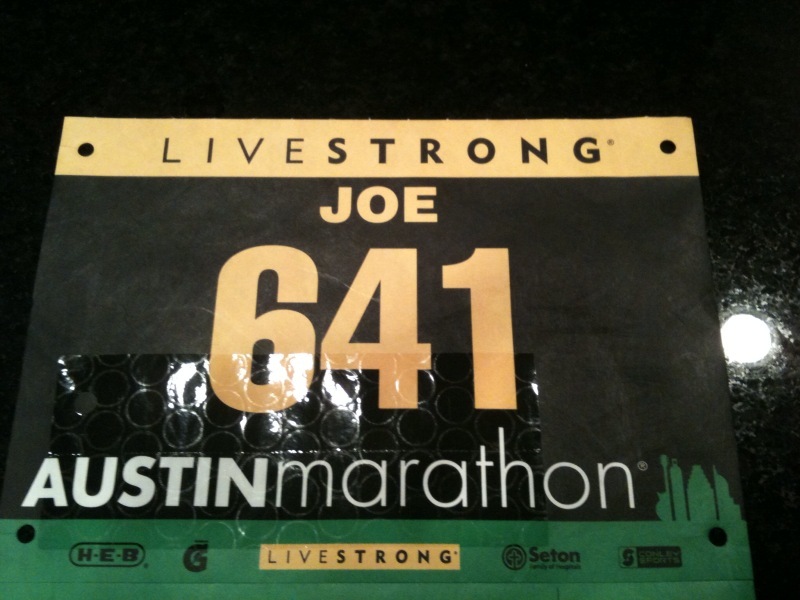 But the 2011 Austin Marathon was all of the above and more for me. Amazingly all of that took place on a 26.2 mile stage in a performance that was over before 10:20 a.m. This was the first marathon I have run in my hometown. I have always traveled more than 1,000 miles for my previous efforts. It was comforting to be at home, eat my own meals that I prepared, sleep in my own bed and even pat my dog Kayla on the head before leaving the house for the race. I woke up at 4:00 a.m. to eat my breakfast of a banana, bagel with peanut butter, a bottle of Gatorade, a bottle of water and a can of flat coke to make sure I had my caffeine for the morning. My stomach was nervous and I wasn’t able to eat my banana. I had a big goal on the board and the pre-race nerves were strong. Dawn was kind enough to wake up early with me to help me apply my Pace Tat to my right forearm marking each of the 26.2 miles off in 6 minute and 52 second intervals. I climbed into my brooks singlet, shorts, runderwear and ST4 Racers and received my last well-wishes from Dawn. The drive down to the marathon start was uneventful and I parked safely near the Texas State Capital at 5:30 a.m. I took the opportunity to read some pre-race thoughts and look at the course map a few more times prior to heading over to the start area at 6:15 am. It was now 45 minutes to go time and I had to make a decision. It was 65 degrees already and the sun had not yet come up over Austin. The flags atop the Capital building were stiff with a 15-18 mph wind out of the South. We would be running directly into that wind up the long climb to the top of South Congress Avenue. 3 miles that would require us to climb 292 feet. Essentially a 30 story skyscraper. The wind would be howling at the runners over the last 8+ miles of the marathon as well. The final 10 kilometers all directly into the headwind. After my last porta potty break I walked up to the starting area and saw my friend Scott who was holding the 3 hour pace group sign. I knew that the decision I was making to run with the “3’s” was going to prove to be a fateful one. It wasn’t a day for 3 hours. Not on this course in these conditions. But I would rather try and fail than play it safe and never know what I really had in me. As the crowd began to press close together I took a moment as I have at every race since last year’s Boston Marathon and crouched down below the bodies. I rubbed my fingers over Dom’s initials on my shoes and told him I missed him. A stray tear rolled down my left cheek and I could taste the salt in my mouth. I stood back up for the end of the National Anthem and got my game face on. Go time. As the horn sounded the Austin Marathon starting line shot bright fireworks into the air from the overhead sign. I pulled through the start and felt the smoke, heat and small sparks hit my shoulders. We took the first strides out onto the course and my legs had shown up. I immediately knew that I had a full arsenal at my disposal on Sunday. My legs had arrived, my heart was full and my head was fully committed. As the runners wove ahead of me through the first two miles we were running a downhill section of the course. 6:51, 6:36 were my opening splits and the cadence felt smooth and easy. It was quite a feeling heading out onto the course with some of the best marathoners in Austin. I was hanging with them stride for stride, mile for mile and my breathing was relaxed, my legs felt great. My training was sound I thought, all that hard work had been worth it. As we started up the hill at South Congress the two men pacing us, Scott and Roger were talking strategy and they decided to stick as close to 6:52 pace as they could to the top. They wanted to just “stay even” as they put it and the group pressed forward. I felt great on the climb. My hill training had helped me for sure and again, I was able to tuck in behind Roger and match the group stride for stride. 6:41, 7:01, 6:46 took us to the top of mile 5, we were going to now make the turn along Ben White Boulevard and then run three downhill miles back into the city. I took my first three Clif Bloks at the 5.5 mile mark in time to swallow them down and then tuck into the aid station to get a cup of water to wash them down. This was my first marathon running without my own water belt. I had raced the entire Austin Distance Challenge using course water stops to perfect my grab, pinch, sip and swallow technique while not breaking stride. All systems go as we approached the 10 Kilometer mark. We chased each other down South Congress and clipped off three miles at 6:42, 6:40, 6:41. Even though our pace was quickening it was due to the topography of the course more than anything else. My cadence, breathing and effort all felt identical. I was locked in. I was doing it. At mile 9 I started to notice that the air was heavy. The sun had come up over the previous 54 minutes and breathing was getting harder. It was an odd feeling as I was not short of breath or oxygen deprived, it was just the humidity and heaviness in the air that was causing me to feel uncomfortable. This was the sensation I expected to feel around mile 18 or 19, not at mile 9. My brain started to tell me that I should back off the pace, but I wasn’t ready to give in just yet. I would stick with the group until we made it to the worst of the hills. Then I would evaluate my situation. Mile 9 came in at 6:51, mile 10 at 6:54. We had started to climb and I was still with the pace group. At the mile 11 mile marker I decided that I simply had to let them go. On a different day in different conditions I would have been able to stick with them. As the group pressed forward and I began to drop off the pace I was oddly at peace with the situation. I could hang with the 3 hour marathoners. But today the course and the conditions were just not going to allow me to prove it. But deep down I knew. I was one of them. As they started to move further and further away I started to feel very alone on the course. I had to make a decision and I had to make it fast. What was still possible? Had I gone out even from the start at 7:15 min./mile pace a 3:10:00 marathon would absolutely have been in my sights for Sunday. No doubt about it. However, my perhaps somewhat foolish decision to stick with the pace group as long as I had would cost me that time as well I knew. I had simply burned up too much energy as we now entered the largest climbs on the course. I had a solid 9 miles of climbing ahead of me. I would lock in and go for 3:15:00. 3:15:00 would still allow me to check off three goals that I wanted desperately when I started this training cycle 20 weeks before. 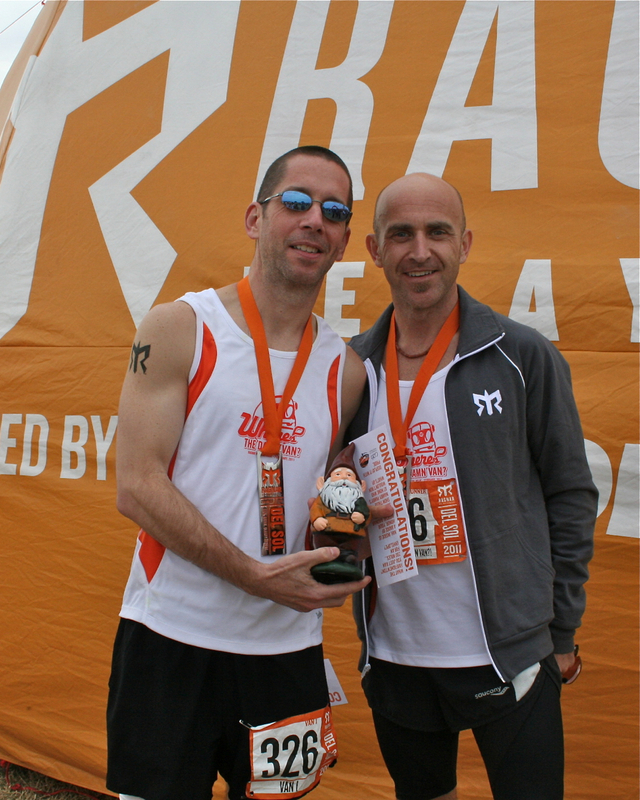 PR – I wanted to run my best ever marathon for Dom. BQ – I wanted to re-qualify for the Boston Marathon. KA – I wanted to Kick @SS. A 3:15:00 in those conditions would qualify. I ran alone over the next 9 miles keeping my cadence even, my effort smooth and zipped in and out of every aid station for water and Gatorade. My singlet was sticking to my skin and I debated a few times taking it off and pitching it to the street. The miles ticked by and even though my pace had fallen to the 7:30 range, I was battling as hard as I dared to push with so much time left in the race. I began to look at it as a 14.2 mile race when I reached the 12 mile marker. Just continue to count them off and save something for that last 10 kilometers. At mile 20 I knew the course would finally tilt back in favor of the runners. If the wind would settle down, I could make back up some time hopefully. Just stay smooth, stay tall, stay fast. 7:03, 7:15, 7:35, 7:27, 7:23, 7:30, 7:51, 7:41, 8:13, 8:09. My splits were sliding, but my spirits remained high. 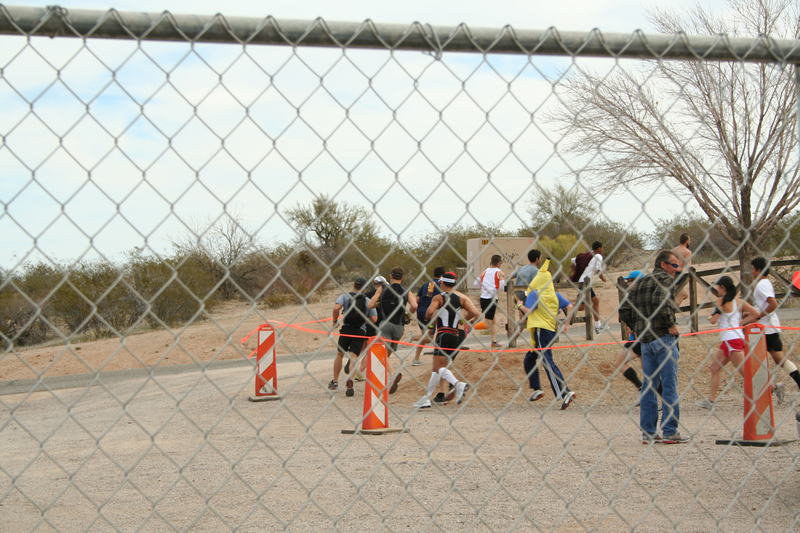 I was holding my own on the course with very few runners slipping by me. Slowly but surely I began to see more and more runners slowed to a walk. The course was taking its toll on the marathoners. People were giving up. As I made the turn at mile 20 and started to head from home there was only 10 kilometers left to go. The shortest distance I run on any day during training. A distance I had run hundreds of times in just the last year. As mile 20 started I took the last of my Clif Bloks, drank some water and chased it with Gatorade. The fight was on and we still had a real shot at our revised goal of 3:15:00. The wind however was now conspiring against me. It was simply howling. Blowing sustained over 15 mph with some gusts much stronger than that. At mile 22 when we reached the Arroyo De Seco section of the course I was alone running through a wide expanse of a divided road. Three lanes wide on my side of the street, a grass median that was 50 feet wide to my left and another three lanes wide of street on the other side. There was nothing to stop the wind and no runners to tuck behind. For the first time all day I actually began to feel a little bit sorry for myself. Now any spectators must have thought that this guy in the Brooks singlet must have finally lost his mind. Who could possibly be laughing this far into the marathon. It was either time to laugh or time to cry and I was going to save those tears for when I saw Dawn and Landry at the finish line. All I could do was laugh at the situation. I continued to fight through the soreness and the pain that was starting to build in my hips and calves. I was getting close to cramping and would need to drink a lot on the way in, hitting every water stop and making sure I took in as much Gatorade as possible. Splits over this stretch into the headwind slipped even further off of pace. 8:16, 8:13, 8:26, 8:28, 8:06. One mile to go. All right, 1.2 actually, but I knew that last 2/10 of a mile was mine. I just had to make it back to the top of the hill at San Jacinto and 11th street. I knew that climb was going to be a killer. I couldn’t run another 8 minute mile and make my time. I needed to dig deep and somehow drop my time back to the 7:40’s. At the half-way point of mile 26 the 3:15:00 pace group came upon me. 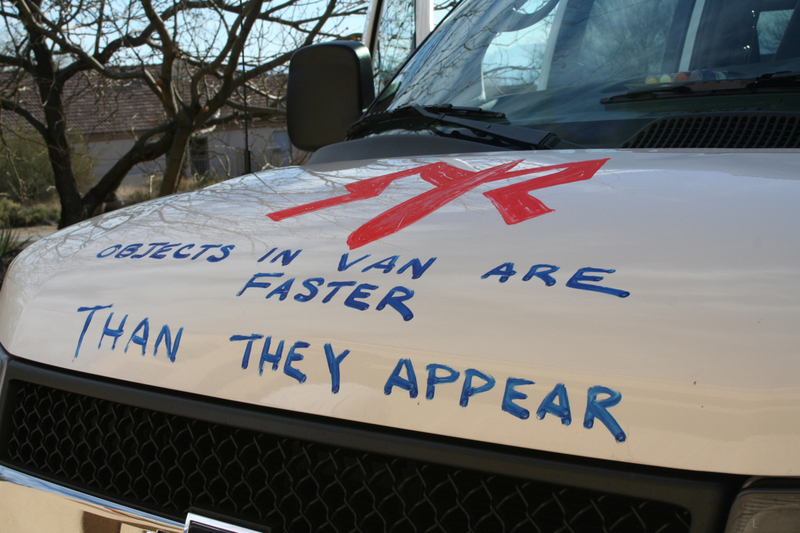 I pulled up next to the leader and asked how they were doing vs. their time. He told me that they were about 30 seconds ahead of their goal. Perfect I thought. Don’t let these guys get away from you and you have it. My legs started to fire and I treated the climb up that final hill on San Jacinto as a hill repeat. I made the right turn onto 11th and broke into my kick. On my right out of the corner of my eye I saw my close friend Neil who is a trooper here in Austin. In full dress, Cowboy Hat, Sunglasses, holster, gun he was standing with the serious look of a lawman on the job. As I shifted gears again I saw along the left side of the course my friends Jodi, Jeni and Deb who had run the half-marathon and finished earlier. They were cheering like crazy and all I could muster was a wink of my eye to let them know I saw them. My legs churned all the way down to 5:38 min./mile pace. I crossed the finish line turning in a final mile of 7:46 and just that short burst over the final 2/10 of a mile. 3:15:01 was my official time. I had come up just :01 second short. The timing clock had shown 3:15:08 when I hit the mat, I knew that I might have just missed my time as I thought I had started about :05 or :06 seconds after the gun, but I could not be sure. No matter I had run two great races on Sunday. The first one I hung in with the 3 hour crowd for 11 miles. The second I missed my goal over the final 14.2 miles by a single second. I had my PR, I had my Boston time and although it hurt quite a bit on Sunday. I think I won in a decision over Lady Marathon. She did not defeat me like she did at Boston last year. As I took my first uneven strides through the chute running legend Bart Yasso was standing before me. It was a moment I won’t forget for a long time as he shook my hand and congratulated me. Bart Yasso …. Shook my hand and told me “great job” after I posted my marathon PR. What a gracious man. Joe might not do so much good with so many people around, but Marruchella will always get my attention. She’s smart like that. She knew what my expectations were for the day and had a pretty good idea how I would feel about my time. A few more of those salty tears rolled down my cheeks, but they were a mixture of joy, relief, happiness, disappointment, a narrow miss and a great accomplishment. I think that is the way most marathoners feel upon completing that event. Seeing Dawn and Landry made it all worth it. I had fought as hard as I could for as long as I could. I came to the race that day planning on leaving absolutely everything that I had on the course. I could not have run a single second faster. As it turns out not a single runner who started with the 3 hour pace group finished with our pacers. My time was good for 128th overall and locked up my position in the top 5 of the Austin Distance Challenge and a 2nd place finish in the Male 40-44 Age group. 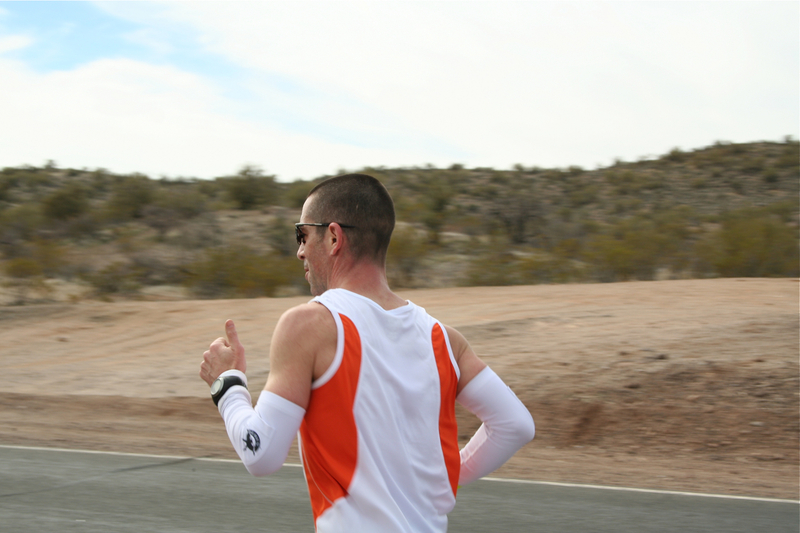 My good friend Brendon Cahoon ran a valiant race on Sunday finishing with a 3:01:04. Looking at the results of many runners who ran Austin last year, including the back to back winner, most everyone ran between 10 and 11 minutes slower than they did a year ago in the conditions. 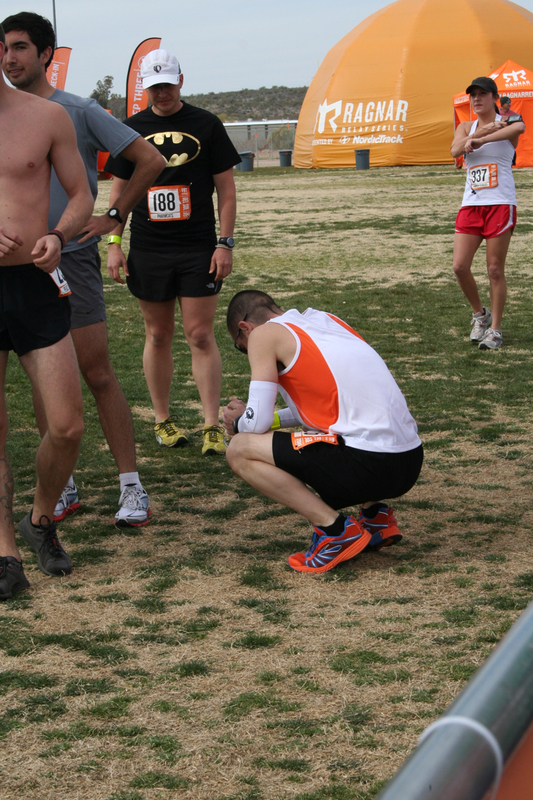 Many runners DNF’d on the course (Did Not Finish), including 4 of the leading 10 in the Austin Distance Challenge. My time may not reflect it based solely on the numbers, but I ran a hell of a race on Sunday. When I looked in that mirror to brush my teeth this morning I saw a different marathoner than I did one day earlier. I’m a 3:15 guy now. The best I have ever been. I’m not one to make predictions this far from my next race day. But if the weather cooperates in November when I travel to the ING New York Marathon and I can put together another 8 months of injury free training. Don’t bet against me on November 6th. Dom, you told me to run this one for me on Sunday and absolutely kill it. I hope you enjoyed that final mile as much as I did. That one was for you. Just a moment ago we crossed over the finish line of the Austin Marathon. A new PR by a little more than 2 1/2 minutes. A full race report will follow tomorrow – I just wanted to thank everyone for all of the great support and motivation to do my very best out there today in memory of our boy Dom. Thank you for all the kind words and well-wishes. I thought of so many of you today as things got difficult. I don’t think anyone really “wins” when it comes to the marathon. It is more about surviving the race. I may not have reached my goal for today’s race on the clock. But I feel I ran with great courage and determination. Conditions were very tough with high temps, high humidity and 15 mph winds. Despite that, I was the best I have ever been today. I know in my heart that Dom would be proud and that’s good enough for me. 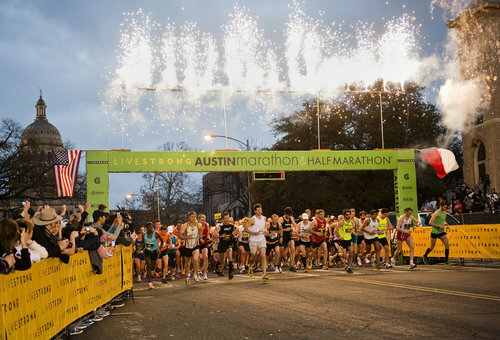 We’re inside 24 hours from the start of the 20th running of the Austin Marathon. The weather forecast for Sunday is not a favorable one for the runners. 63 degrees at the start of the race, increasing up to 75 by Noon. Humidity at 96% at 7:00 a.m. when the starter’s gun fires and winds around 8-10 mph. It should be a great day to spectate and the Austin crowds should be out in full force encouraging the runners along the 26.2 mile loop course. For the runners however, it’s going to be a tough day out there and hydration is going to be a key variable when mile 20 is reached and the 10 toughest kilometers remain before the finish line is crossed and the timer finally stops. I stuck to my traditional taper this week and only ran 3 miles on Tuesday, 4 on Wednesday and a short 2-mile shakeout run this morning. The shake-out is just a way to burn off some energy, get the legs moving a bit and help those muscles remember on Sunday what they need to do when they take their first strides out onto the course. I ran miles of 6:35 and 6:29 this morning and felt pretty damn good out there honestly. I’ll need to hang in at 6:52 pace for 26.2 miles tomorrow. It won’t be easy. But I feel like we’ve given ourselves an opportunity to get there. For a runner like me who habitually runs 5 times a week covering somewhere between 45 and 60 miles, a week where I only run 9 miles feels very strange. Your legs feel heavy. You start to feel lethargic. You wonder if those legs will “show-up” for you on race morning. Today however I don’t have those usual sensations. My legs feel great. My body feels great. My mind? Pretty great actually. I’m not sure if racing here locally in Austin has taken away a lot of the stress that I have experienced prior to my previous marathons. Having to fly across the country, check into a hotel, search for the right foods, meet-up with family and friends, dinner reservations, worrying about packing the right race gear, getting to the start on time etc., etc., etc. For this race I’ve been able to stick to my usual routine and it seems to have kept me on a very even keel. I think I like this “local race” thing quite honestly. Now make no mistake, I fully expect to lay awake half the night tonight, possibly more, my race plan and the course playing over and over in my head. By 6:00 a.m. tomorrow I will be ready to jump out of my skin. After my final stop at the porta-potty and lining up at 6:30 it will get worse. By 6:55 when the wheel chair athletes take off I will be bouncing from foot to foot, foolishly burning energy that I should conserve for the battle. But I won’t be able to contain myself. It is like pressure that needs to be released from a valve. Then BOOM – race time. The plan that I put together last week had to be revised slightly as the weather is a real factor for Sunday. Instead of shooting to pass the half-way point at 1:29:30 +/- I am going to have to be a little more flexible with my race plan. I ran into a friend of mine Scott at the Austin Expo on Friday afternoon. Scott and I raced at the Harvest Fest 5K Back in October in Georgetown, TX. Scott finished first overall. I finished second. He asked me what time I was shooting for on Sunday and I shared with him that originally I was thinking 3 hours was a possibility for me, but the recent weather reports had me thinking something a bit more conservative. It turns out that Scott is leading the 3 hour pace group and urged me to run with him. He feels that I have a legitimate shot at breaking through that mystical barrier and he is definitely a runner I trust. After talking about his strategy of running even mile splits up through the hills at mile 14, I decided once and for all I’m in. I’m going to give it my best shot and see if that pace agrees with me on race day. If my breathing is labored trying to lock in to that 6:52 pace in the heavy humid morning air, I may need to back off a bit to find my comfortably hard pace. It may be 7:02 it very well could be 7:12. I will have to stay calm and let that heavy air burn off and just wait a bit before trying to push pace again. Hopefully when those 6:52’s start clipping off I’ll feel strong and powerful. I know that if I can hang in with Scott and the group the odds every mile will begin to tilt more and more in my favor. The fact is that if I do not at least give myself a chance at the 3 hour mark over the opening 6-8 miles, the improbable will become the impossible. I have to just give myself a chance. That’s all anyone could ask for chasing after a big goal on race day. It is a funny race the marathon. You “run” for 20 miles all for the chance to “race” the final 10 Kilometers. It requires a lot of patience and a lot of mental strength to block out everything around you – the other runners, cheers of encouragement, the clock, pain, discomfort, hills even surges of adrenaline – and simply run your race. In the end that is what I know I have to do. Run my race, nobody elses. I realized that Dom did not place a time goal on that statement. He didn’t tell me to run 3 hours or 3:05 or 3:10. 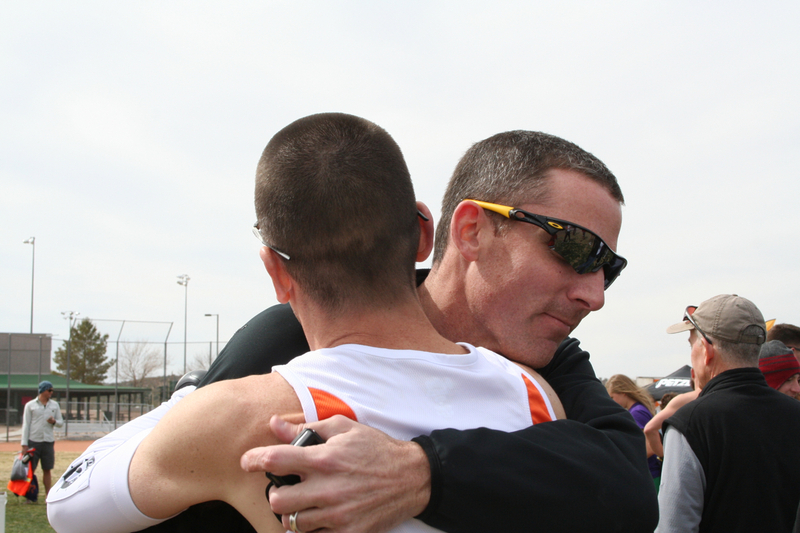 He just wanted me to run this next race for me and do my very best. So that is what I am going to do tomorrow. I’m going to be a little selfish for 3 hours. I am going to zero in on my race, my battle with the marathon and see just what I’m made of. I have some ideas of the numbers on the clock that will make me happy on Sunday, and some numbers that would disappoint me. But they will be my numbers no matter what, and they will be the very best that I could do on that day. I’m sure there will be other marathons in my future. The next one will be NYC in November. Maybe I will be running that one for a different reason with a different goal in mind. But tomorrow it is pretty simple. There is nothing left to do but go out there and “kill it”. Thanks Dom. I miss you my brother. The running world was quite abuzz on Wednesday as a press release from the Boston Athletic Association informed Boston Marathon hopefuls of the changes they would be making to the qualification and registration process over the next two years. In case you missed it there was a huge backlash this year when registration for the 115th Boston Marathon to be run on April 18, 2011 filled in just one day. Thousands of Boston qualifiers were on the outside looking in as they simply did not have a chance to log on to the internet and get their application in before all of the spots were taken. It used to be that you needed to be a fast runner to qualify for Boston. This year you also had to be a fast typer. On Wednesday the B.A.A. announced that they would be tightening the qualifying standards beginning with the 2013 race (more on that later), but for 2012, they would be moving to a “rolling registration process”. 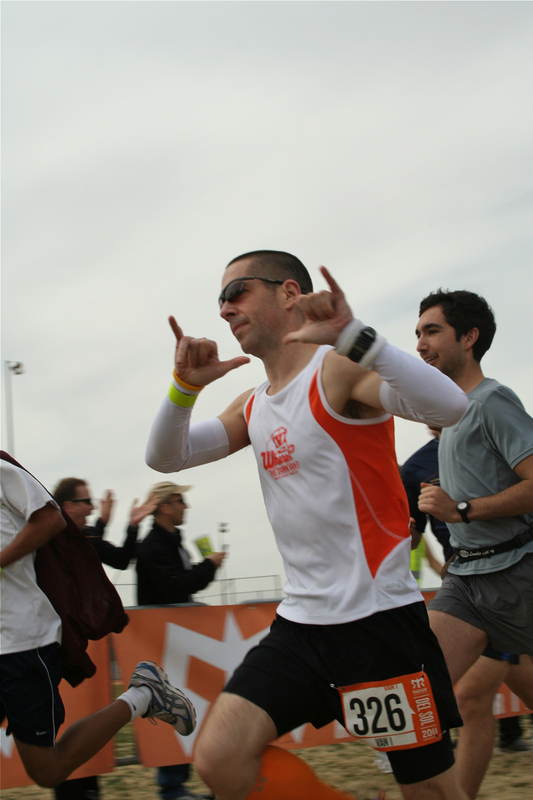 Registration will open on Monday, September 12, 2011 for the 2013 race for runners who had surpassed their qualifying time by 20 minutes. Two days later on Wednesday, September 14th, registration will open for those athletes who surpass their qualifying time by 10 minutes. On September 16th, runners will be able to register who bettered their qualifying time by 5 minutes. If there are still openings available, all qualified runners will be able to register beginning on September 19th. By September 23rd, registration will close and runners will be notified of their acceptance by September 28th. This will really put the onus on runners who are hoping to not only qualify for Boston but to actually “RUN” Boston to better their qualifying times by as wide a margin as possible. This will allow for earlier registration and a chance at locking up one of the 20,000 +/- spots that will go to qualifiers. The remaining 6,000 +/- spots will be held for sponsors, charity runners and corporate partners. More on that topic a little later. In 2013 the qualifying times themselves will get tougher, and the rolling registration process will remain intact. The impact of this is significant. 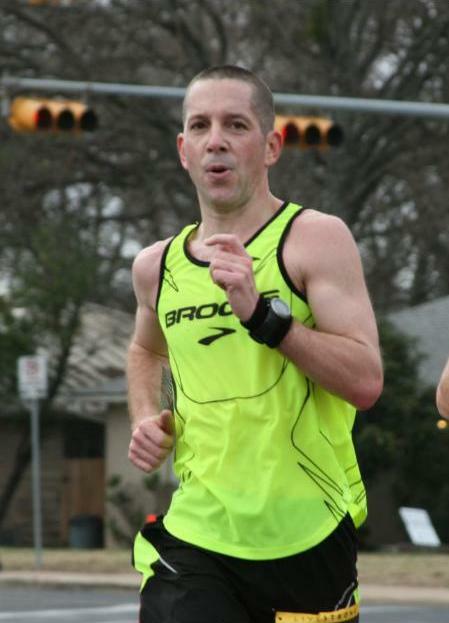 My qualifying time heading into the Austin Marathon on Sunday remains, 3:20:00 or 7:37 min./mile pace. To essentially guarantee entry into the 116th Boston Marathon in 2012, I will need to better that time by 20:00 minutes, or achieve my pie in the sky goal time of 2:59:59 or 6:52 min./mile pace. That will allow me to apply for the race on the first day of registration and lock up a spot in the field of Boston Marathon participants. Should I be able to run a time under 3:10:00, I would be afforded the opportunity to apply during the second “wave” of applicants and most assuredly still gain entry into the race. A time slower than that, and now it is starting to slip out of my control and into the control of others. There will be other small changes such as removing the :59 second “grace allowance” that allowed runners a full :59 seconds above their qualifying time to still be eligible. Essentially making my qualifying time 3:20:59 instead of 3:20:00. That may not sound like a big deal, but over the course of the marathon that is more than :02 seconds/mile of leeway that is no longer available. It does come down to that for many runners chasing a stretch goal. What I think is going to happen over the course of the next two years is that runners who are serious about running Boston are going to set their sights on times that are 5 and 10 minutes faster than the qualifying standard and train to hit those race goals. We will see “fastest ever” qualifying fields and make Boston an even more prestigious road race. Perhaps the most prestigious in the world. Good. That is what it should be. Where I have problems with the decision of the Boston Athletic Association is that they did nothing to address reducing the amount of non-qualifier spots held for charity and corporate entries. Keep in mind that I am in fact a charity runner. I get it. But if you are going to hold yourself out as the preeminent Marathon in the world, with qualifying standards to receive entry, than more than 25% of your spots should not be held for non-qualifiers. Have you ever heard the joke about the golfers who are playing behind a foursome at the Country Club? Well, the joke goes that the foursome up ahead is hitting balls left and right out-of-bounds, into the woods, into the lake, sand trap, over the green and sometimes just swinging and missing. It takes the group close to 45 minutes to finish just the first hole. Two golfers waiting behind them on the first tee ask the starter what in the world is going on up there? How can they let those guys out on the course, it is going to take them all day to finish their round. The starter looks at the two men and says, “Relax guys. They’re blind”. I’m all for the charities, sponsors and corporate partners getting a chance to run the famed Boston course from Hopkinton to Boston. It remains one of the greatest experiences of my life. That said, let them run later in the day, on Sunday instead of Marathon Monday, hell, let ’em run at night. But if you are going to hold yourself out as one of the rare marathons that requires a qualifying time for entry, then don’t let more than 25% of your field onto the course without having to meet those same standards. As for me. I plan on being back there in 2012 and will be fighting tooth and nail on Sunday for every single inch, every single second to get my chance to exact a little revenge on that Boston course. I’m not trying to return to Boston for the experience. I’m hoping to return there and reclaim what that course took from me last April. The fact that I am a better marathoner than Boston is a tough course. It will have taken me at least two years, thinking about that race every day until I get back there. When I do, I plan on leaving no doubt.